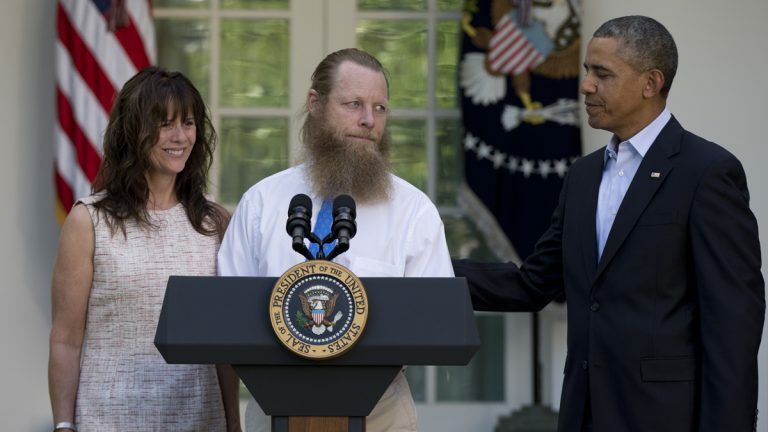 Will logic of war keep Bowe Bergdahl, and us, imprisoned? The effects of captivity, especially in the Muslim world, seem to vex Americans. Captivity and isolation try to steal our humanity. My sense of self was my lifeboat in the foreign world of captivity. Bowe Berghdal’s father thought that his son forgot English in captivity. At a press conference with President Obama, Bowe’s father even thought it necessary to remind Bowe who his father was. When I watched those moments on TV, I couldn’t believe it. The effects of captivity, especially captivity in the Muslim world, seem to vex Americans. I wrote a captivity memoir. I’ve also spoken to dozens of audiences and had countless discussions about my two years in Iranian prison. Strangers and new acquaintances are generally surprised when I casually refer to going on hunger strike, to months in solitary confinement, or to dealing with “my interrogator.” One of the most common responses is a sympathetic statement like: “I just can’t imagine what it was like over there.” Americans seem to be able to imagine what prison is like in the United States. But captivity in the Muslim world remains unthinkable. I listen to Bowe’s story without his experience being unthinkable. The details interest me. The ethical choices intrigue me. The terror of it shakes me. It is only with great effort that I can conceive of Bowe’s devastation upon hearing that his welcome home party was cancelled, and the dread of the prospect of spending the rest of his life in American prison. Yet, because of my 26 months behind bars, being thrown into the media circus, and being used by every political tendency, I can imagine Bowe’s story. Captivity and isolation try to steal our humanity. The struggle is to hold fast, stay determined, stay human. I passed endless moments of solitary confinement by clinging to visions of freedom, celebration, and reunion. I clutched to my sense of myself — as a member of a family, a community, and humanity. I affirmed my belief system — not just spiritually, but my belief in a world where social justice reigns over political jockeying, economic immiseration, and militarism. My sense of self was my lifeboat in the foreign world of captivity. Bowe’s travails, the human aspect, should elicit empathy in all of us. However, the politics surrounding his story inevitably brings the fog of war back home. At my talks, the audience’s faces are often pained while listening to my hardships, but some people (usually men), move quickly from human sympathy to colder calculations. They want to know who was justified in doing what. Was my captivity “our” fault or “theirs” — or, of course, was it mine? We who have been held hostage intimately know this ongoing struggle between keeping our humanity and the encroachment of political logics. It is a fight that takes place both inside of prison and without. Politics just never goes away. We live in a world structured by laws. In captivity, however, I was most interested in ethics not laws. Would I kill a guard to escape? Is it stealing if I take an orange from the lunch cart when they’ve already deprived me of so much? Should I lie and confess guilt for a crime I didn’t do in order to petition for clemency? Lawyers and jurists are ultimately delegated to determine the law — yet ethics are questions for everyone in society. Is it ethical for some people to be locked up for smoking pot? How about the ethics of some people owning more wealth than millions of impoverished people? Or government surveillance? Or targeted killing without a warrant or a war? Questions like these are animating our society right now. My interrogators did not justify my imprisonment to me on legal grounds, because they knew I was innocent. They did not rationalize my incarceration by repeating their government’s political demands for nuclear concessions or the release of particular Iranians in American jails. Rather, my interrogators justified my detention with ethical claim of my responsibility, as a citizen, for U.S. government action in Guantanamo Bay. To them, ethically, I had no right to complain of my conditions. I had taken pains to show the judiciary that though I did not support the Iranian regime, neither did I support U.S. policy in the Middle East. However, my judge, Mr. Salavati, in Revolutionary Court 15 seemed to agree with George W. Bush’s dictum, “You’re either with us or against us.” I was judged guilty simply for being American. When Bowe Bergdahl left his military base, he must have imagined himself to be in a literal and a metaphoric no-man’s-land where he’d be able to criticize the American military while still opposing the Taliban. In war, be it a cold war or hot one, the space for such nuance is lost. Cruelly, Bergdahl found that he was not in no-man’s land, he was in Taliban territory. For this, he suffered five years. Now that he’s back in American territory, will the logic of war keep him captive for the rest of his life? Moreover, will that logic imprison how we understand Bowe Bergdahl, or can we bust free? Joshua Fattal is an author and doctoral candidate in history at NYU. The Cheltenham native was one of three Americans detained by Iranian troops on July 31, 2009, while hiking in Iraqi Kurdistan.